CUSS PLUS: Call us crazy, but we never noticed our raingear cussing before. 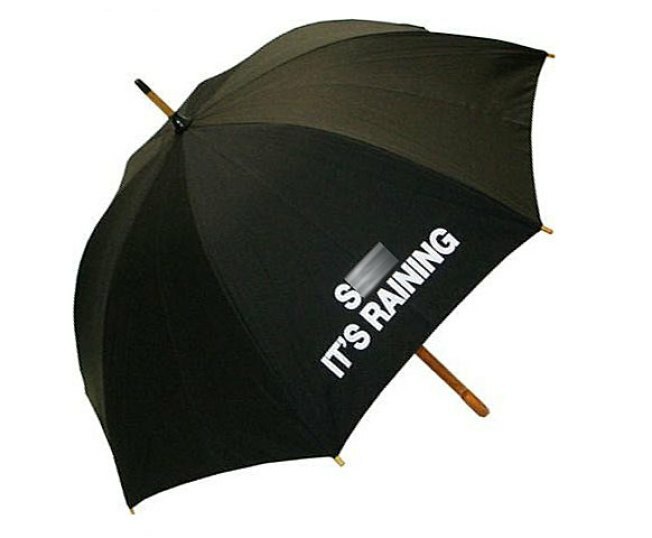 Maybe it's 'cause we didn't have the S***, It's Raining Umbrella ($45 Canadian, or about $40.60 U.S.). Yeah, you'll have to get this shipped from our brethren to the North, but ask yourself if you've ever seen a more perfect barometer of public opinion. Yeah. We thought not. EYE SPY: Create the perfect smoky eye even in the bathroom of HR-57 with the Dior JazzClub Total Eyelook Makeup Clutch ($65). The black patent clutch is decked out with Dior's signature silver toggle and filled with four eye shadows, a brow-shaping powder and a cream-to-powder eyeliner, "perfectly coordinated" (of course) for a smoky style that says no really, you are definitely ready for fall. Available from Sephora (3065 M St. N.W. ; the Fashion Centre at Pentagon City; Tysons Corner Galleria; 7101 Democracy Blvd. #2042, Bethesda) and online with free shipping. NOT SO MELLOW: Triathletin' is the latest sports trend 'round these parts, and even if you're not panting in the slow lane, you can become your friends' hero capturing their moves with this waterproof Sanyo Xacti WH1 with a 2.5" LCD monitor. Plus, it's yellow, so you automatically know it's sporty. Get the best vids as they heave their slimy selves out of the East Potomac Park pool after practice while you barely break a sweat. The cam can handle submersion up to five feet, so just make sure that no one pushes you into the deep end. Trust us. That's good advice.